Edited: This post contains affiliate links, which means if you make a purchase using these links, I will receive a percentage of the profits. Well, once again we’ve been stuck in the house, as blizzard #87 came and went over the past few days. Honestly – I have always loved snow and cold weather. But that was back when I could appreciate the silence and peacefulness a fresh snow brings, or when I could still leave the house whenever I wanted, or when I was young enough to put on my snow pants and flop down in it. Nowadays, there’s nothing silent in my life ever, the temperatures are in the negatives so we can’t go run errands or leave the house, and the snow is layered higher than the height of my twins, so no, I can’t enjoy the snow and therefore wish for it to go away. We have had six snow days in a month or so and have averaged a big storm once a week. On a positive note, there have been plenty of opportunities for us to try out some fun, cheap, educational activities. 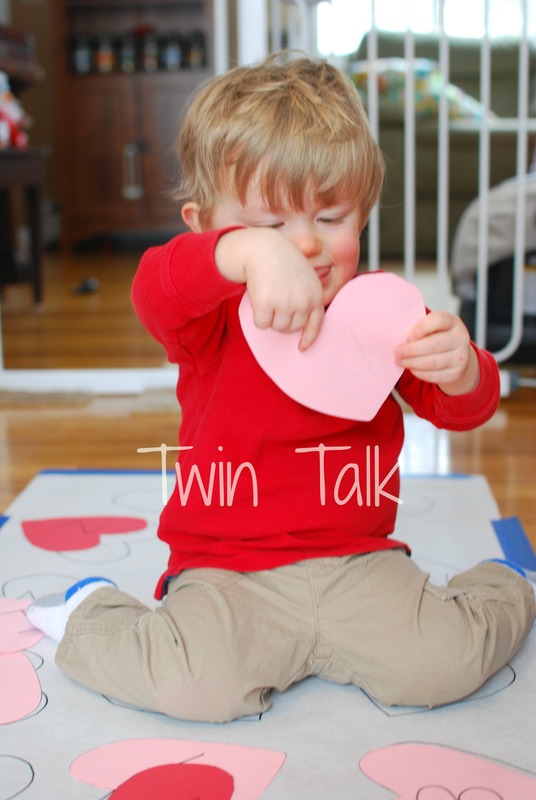 The twins and I have been on a Valentine’s Day kick lately. We enjoyed Valentine’s Day Soup in a water bin, a peppermint-scented Valentine’s Day themed rice bin, and played with Valentine’s Day colored pom-poms. I decided to finish up our Valentine’s Day activities with a few more over the weekend. 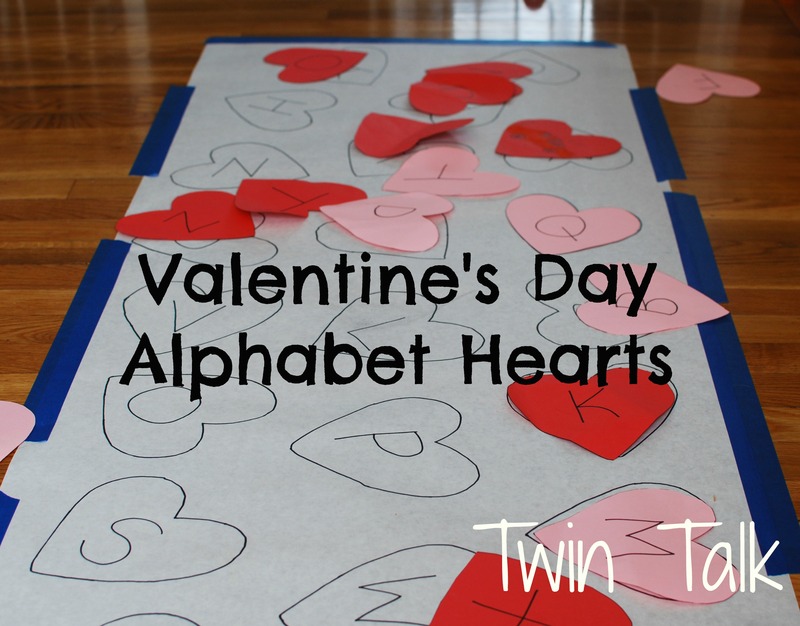 Yesterday, we played a Valentine’s Day alphabet matching game. I got the idea here and loved it as soon as I saw it. 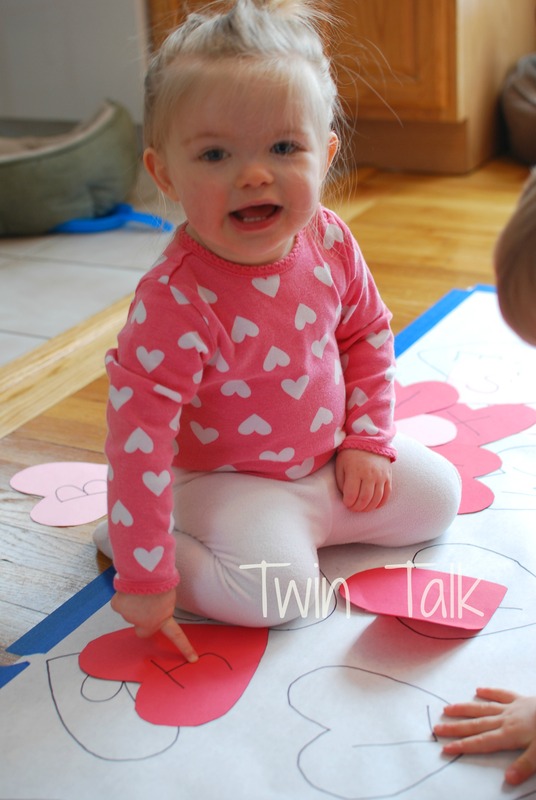 The twins know most of their letters and love to point them out. Plus, it wasn’t messy, and best of all, it was FREE. 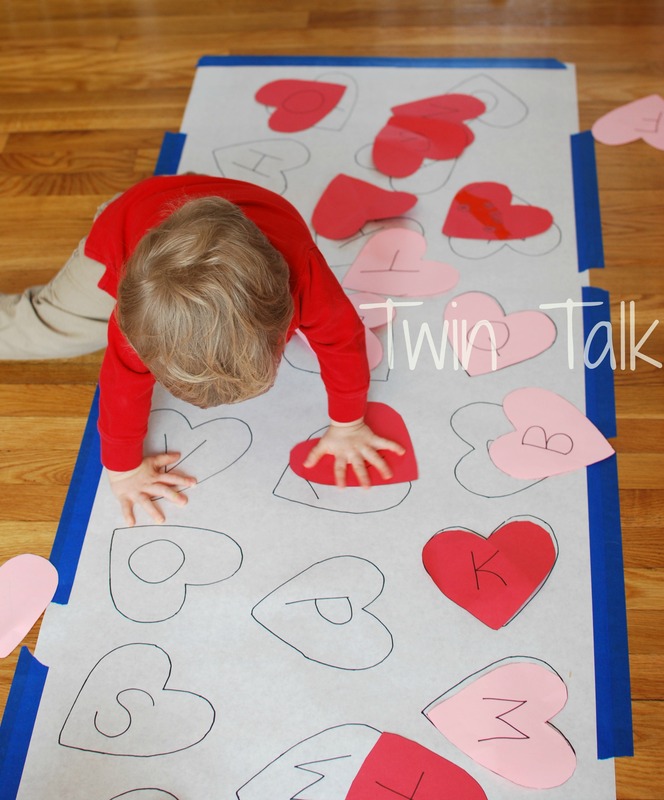 I have a roll of butcher paper that has so far been well worth the purchase, (you can find it HERE) and cut a long piece of it for this activity. I also had some pink and red construction paper, which I cut into hearts and wrote the uppercase letters of the alphabet on. 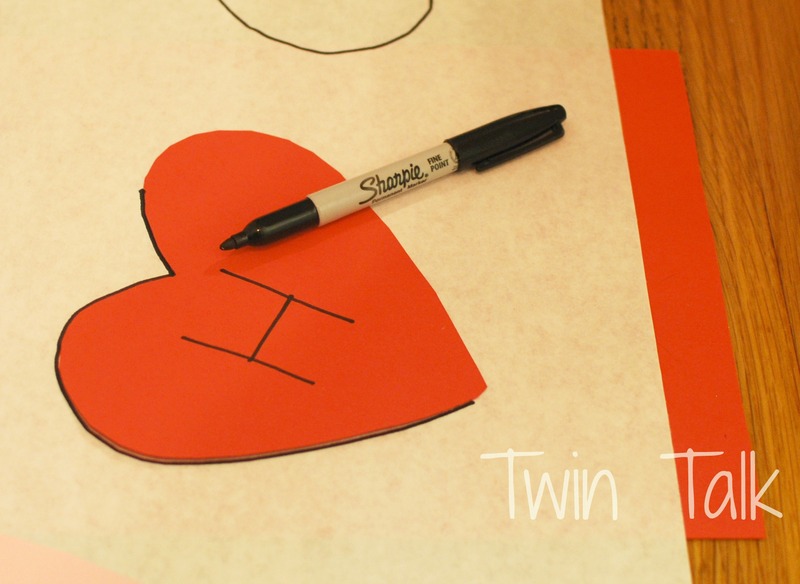 The night before I planned to use it with the twins, I laid the hearts down along the butcher paper and traced them with a sharpie. Note – sharpie runs through, and I almost learned that the hard way. Luckily, I remembered in time and slid an extra piece of construction paper underneath the butcher paper to avoid writing on the wood floor. 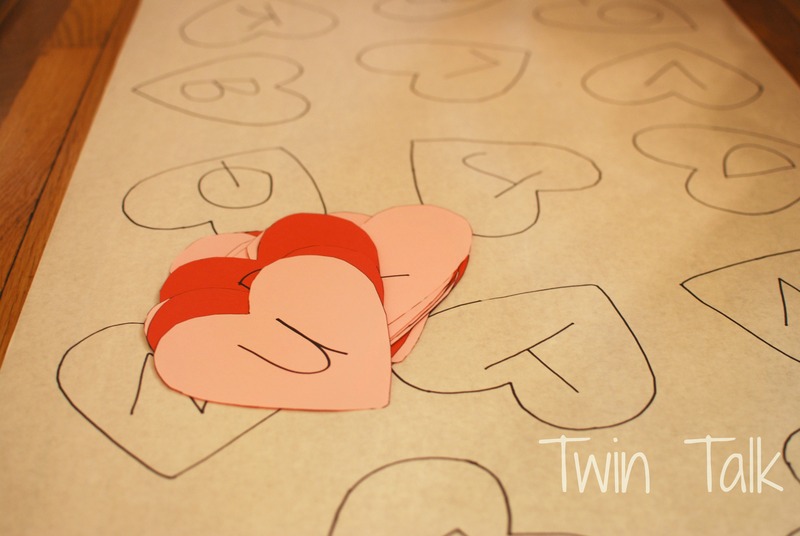 When I was done, I had 26 hearts traced onto butcher paper with the letters of the alphabet on them and 26 red and pink hearts to match. The next day I set it up. We have a small house, so to get the space I needed I had to move the dining room table. 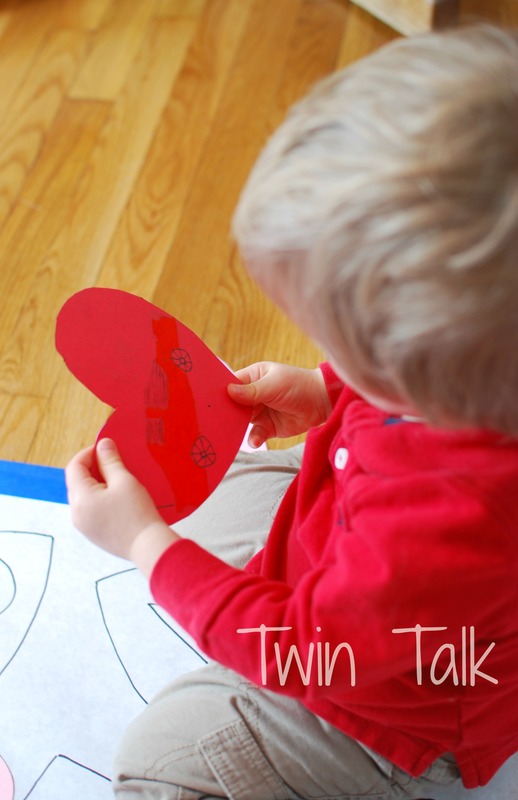 Now – I keep trying activities with my 19 month old twins (as of yesterday!) that are typically used with 2+ year olds. I imagine that 3 year olds don’t try and tear off the ground or table whatever you stick there, or immediately take what you’ve been creating for them and crumple it into a ball. Or maybe they do. 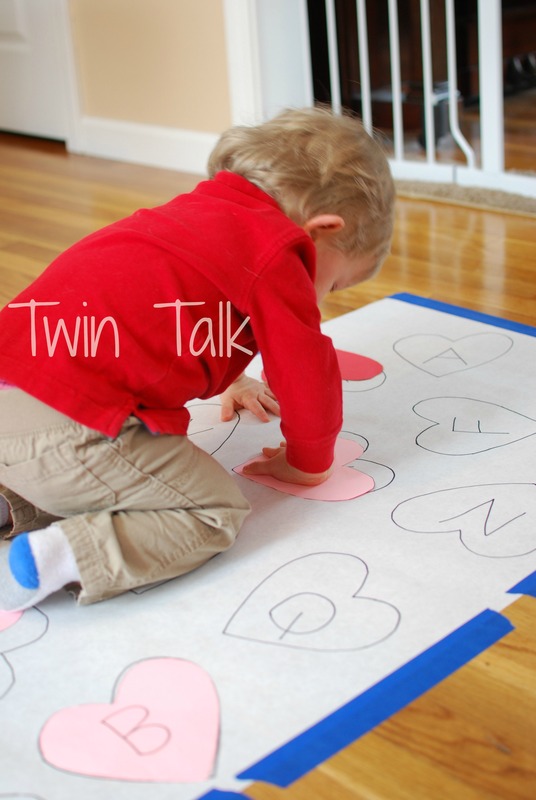 Whatever the case, I waited until the twins were in another room playing to tape the butcher paper down to the floor with painter’s tape (the best invention ever). I had to be quick about it – they would step all over it and crinkle it up before I even got it taped down. When it was ready, I called them in to check it out. As is the case with almost every single activity I throw at them, C is only interested for a few minutes, then goes to play elsewhere and comes back later on, while B puts all of his attention and interest in whatever he is supposed to do. He really loves a new activity and the new stimulation that comes with it. They both enjoyed identifying the letters, which is what I hoped for. They were almost overstimulated, with the letters written twice for them and so close together. But they had fun pointing them out. I was able to bring in the hearts to school a few days ago, and during recess a few of my fifth graders started drawing on the backs of the hearts with a picture that corresponds to the letter. They weren’t able to get all of them done, but B enjoyed checking out the car on the back of the “C” heart. As for the matching – C had already taken off and checked in every few minutes, but she wasn’t interested in trying to line up the letters. B was very interested. 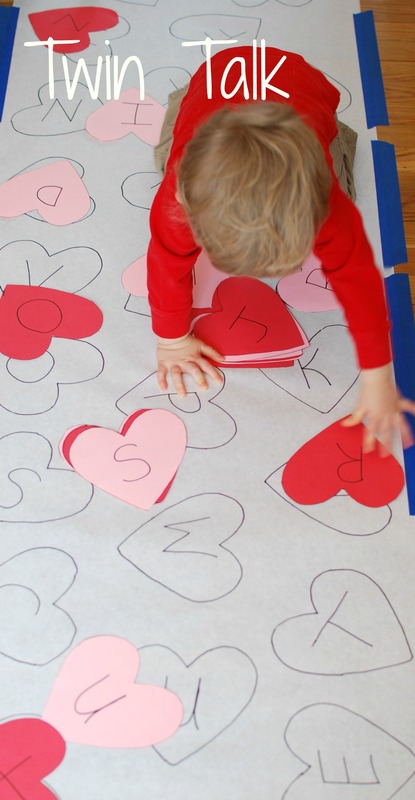 The only problem was that he wanted the hearts to stick to the paper when he found a match. He would slide the hearts down the butcher paper, line them up and be disappointed that they moved again so easily. I can understand – it was almost like a puzzle, but it wasn’t. 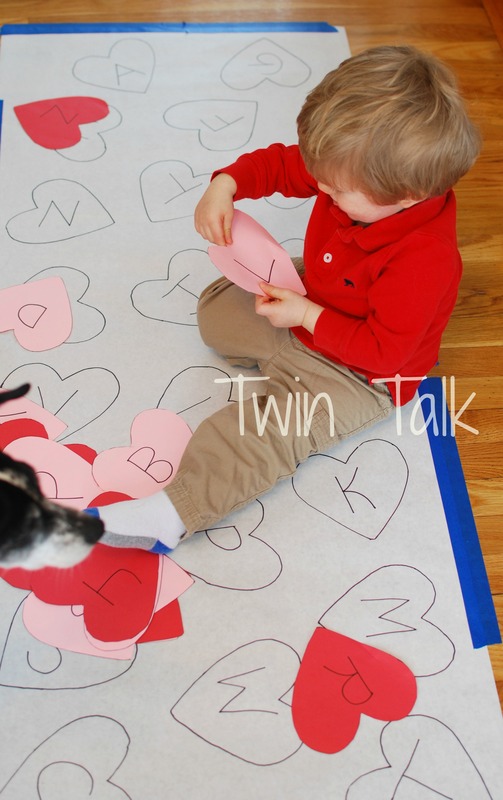 Thinking about it now, I could add a little piece of velcro to the butcher paper and the hearts, and then they would stick. Next time! I would absolutely consider it a success, though I’ve rolled up the butcher paper and clipped the hearts to save for next year. My kids were on the young end of being able to do what the activity is meant for, but they still had a great time with letter identification. That is great! There’s no way my twins would understand this activity. They just started understanding puzzles, like last week, and don’t know any letters. Something else to work on I suppose. I hear you about the grabbing, crunching mess. I use those disposable placemats when we go out to eat and I can barely get those down without interference, much less a sheet of butcher paper! Ugh – yes. It’s impossible to get a minute alone without being stalked, so setting things up is a challenge. Yours wouldn’t understand the activity yet but they will so soon! Mine didn’t either at yours’ age. All of a sudden at like 16-17 months things started taking off. How are puzzles going? I wish mine would do puzzles more often – they’re quiet! Well, it’s going. I’m trying to keep the pieces from walking off so they only get a puzzle every once in a while. The last time, they sat and played with it for five full minutes, after I showed them how to do it. They’ve got the idea but not quite the skill yet but I’m amazed at their progress. 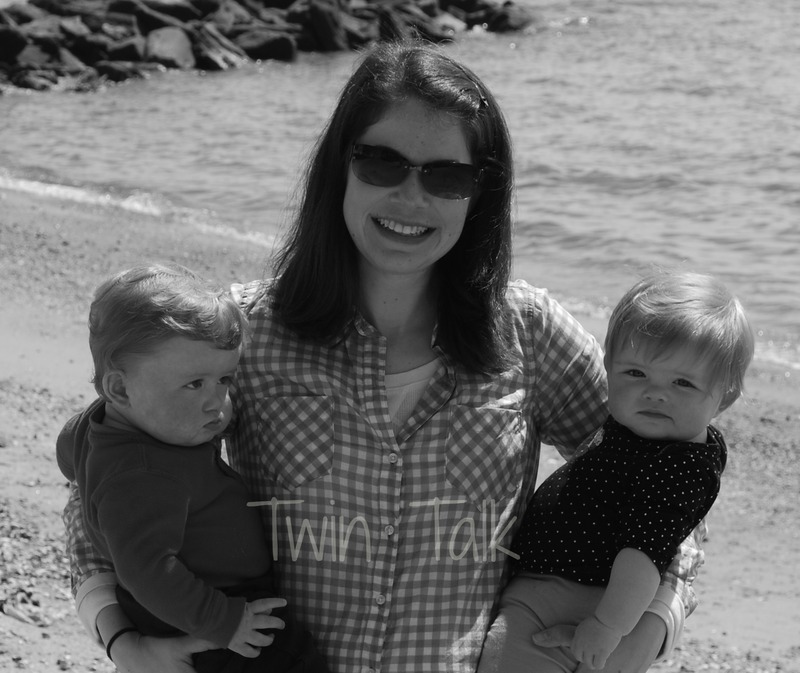 Welcome to Twin Talk! 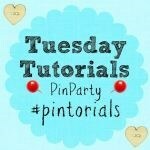 Visit my menu for all things toddler, plus a touch of photography and clean eating! Visit my new Facebook page! First time ever trying #starbucksmode while writing today...everyone was super engaged; you could’ve heard a pin drop! And they clearly took the “fake coffee” seriously 😂 We will definitely use this one again soon! If you’re just joining, welcome! I’ve switched to positive parenting, and I’m not looking back. There’s actually so much good.